Uptown Energy Solutions is Florida’s premier Full-Service Solar Consultant. We’re working to provide high-value service to the solar energy industry, to solar energy consumers, and to the planet Earth. We like to call this a Win-Win-Win. As a full-service solar consultant we offer solar energy consultation and project management services in Orlando, Windermere, Lake Nona, Lake Mary, Doctor Phillips, Tampa Bay, and Melbourne, FL. Now, you can truly define your Solar Style. Through our Gold Standard Solar Investment Strategy, we are able to satisfactorily address all of our client’s concerns in 7 simple steps and make going solar totally painless. One of the key ways we’re doing this is by working to completely switch our clients’ mindsets from “How much will this cost?” to “Here’s how much I would like to invest”. That’s right: from the very beginning, you tell us what your budget is and our goal is to make your Solar Energy Investment a reality. By now you probably already know that installing solar has many benefits, including its popular ability to save you a lot of money on electricity. But, by now you may also realize the process of having a solar system installed can be a long, confusing one. You might also hesitate to trust a company you have never worked with before with such a big investment. Honestly, you’re not alone. Consumers interested in solar energy are contacting more and more installers these days before signing a contract. While getting many quotes is a good idea, and educating yourself is always a smart move, it can be difficult in practice. As you go through the process, you’ll end up wasting a lot of time and receiving conflicting information from different sources. Of course, it can be difficult deciding which of these sources to trust. The tough part is, deep down you know that every installer just wants you to buy from them and only them. But which solution is actually in your best interest? Wouldn’t it be nice if you already had a solar energy expert on your side before talking with installers? At Uptown Energy Solutions, we’ve found that many people have an unfortunate, but intuitive lack of trust in those selling solar energy. This leads consumers to demand a very common question up-front: “But how much will it cost me”? This is an important question. You should absolutely use total cost as one piece in determining a project’s value. However, we believe there’s a much better way to look at it. We all need to remember that solar is an investment, similar to a stock or bond, not a raw expenditure like a car. You can invest a lot, or you can invest a little. The choice is yours. Cost is only one of many factors to consider when thinking about giving your home some solar style. There are over 100 solar energy installers operating in Florida, and each company offers a different set of skills, products, additional services, and experience. In reality, there are at least 5 other concerns that you should have about installing solar on your roof besides cost alone. So with so many things to consider before going solar, how does anyone do it? Well, before Uptown Energy Solutions, the answer was simply to spend a lot of time researching and thinking about it. Without professional help, the decision making process can take a full year or more. With our help, you’ll be able to confidently do it in less than a month. Now how will that sound to your snobby friends and coworkers? We provide a non-biased platform through which local installers and national names can compete for customers based on price, product, experience, availability, and culture. As a bonus, we are reducing the soft costs of customer acquisition by educating customers on their options before bringing the installers’ staff in to quote the project, meaning more money for the installer and less cost for the client. Uptown Energy Solutions prides itself on being an expert in the industry, most of all in regards to its knowledge of the leading solar installers and what makes each of their services unique. We are proud to provide our clientele with accurate, up-to-date descriptions and comparisons of the installers which serve their area in order to help our clients make the best decision possible based on their priorities. 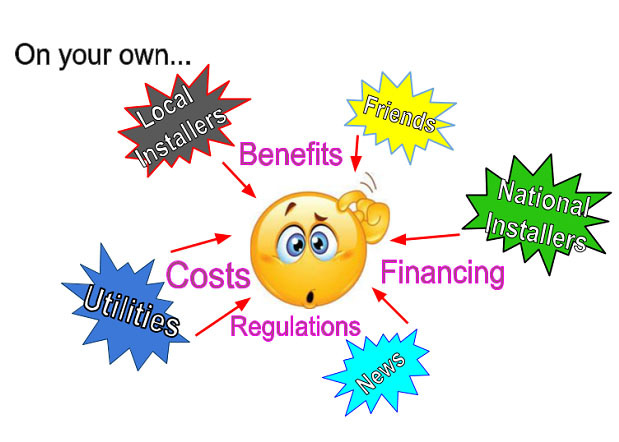 These are the factors that all solar customers will have to consider, whether it is with the help of a U.E.S. Solar Energy Consultant or on their own. The advantage we bring is our ability to clearly identify where each installer excels and keep customers focused on the key points that we in the industry know really matter. Whether it’s from a large national brand or a local small business, we ensure our clients receive service tailored to satisfy their Solar Style. If you’re curious why you haven’t received any customers from UES, contact us to make sure we have your latest marketing materials and we can provide you with some feedback we’ve received about your company while sitting with our clients. In the meantime, you may also choose to complete our Solar Pro Profile online in advance to ensure we receive your updated information as soon as possible. And you should never be concerned, we only share the private information you provide us with our clients, never your competitors. If you offer something truly unique that separates you from the competition, we want to make sure our clients know about it! We provide expert knowledge and installation experience directly to residential and commercial clients without the inherent conflict of interest that comes with representing a single company or product. Our project managers work directly with the customer to answer their specific questions and tailor a solution for their unique needs. As Florida’s first Full-Service CoSolar nsultant, we’re putting power back in the consumers’ hands. Your time is worth way too much to spend it researching the complexities of a solar installation. From solar theory and policy, to site evaluation, financial analysis, and project management, we understand it can all be very overwhelming. That’s why as part of our win-win-win mission, we’re providing consumers with the best of all worlds solution: one personal expert – multiple quotes. 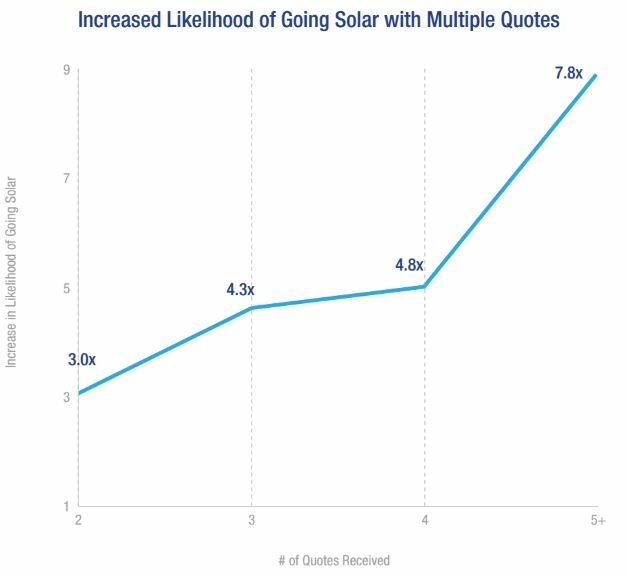 Recent research proves it: consumers are 8 times more likely to install solar after receiving 5 or more quotes. Services like Uptown Energy Solutions are helping increase solar adoption by making it easier to find the solution that’s right for you. Our work supports industry growth and promotes the adoption of solar power generation by home and business owners. This in turn will reduce our fossil fuel dependence and, therefore, our greenhouse gas emissions. It’s simple: the more energy we capture from the sun, the less fuel we need to burn. Together, we can make a difference. In the United States’ recent Inventory of Greenhouse Gas Emissions report, which was developed by the EPA and submitted to the United Nations Framework Convention on Climate Change (UNFCCC) in 2014, tells us that average land temperatures, ocean temperatures, rainfall amounts, and ice melt are all increasing. Each of these is an indicator of global climate change, and by analyzing ice core samples in Antartica, we know that greenhouse gas concentrations in our atmosphere are at an unprecedented level. It is hard to argue that humans are not causing this climate change, largely through the burning of fossil fuels for electricity generation. If we distribute the emissions from electricity generation among the various sectors which use that electricity, we would see that 41% of all U.S. emissions from burning of fossil fuels are attributable to residential and commercial electricity use. This means that powering our homes and businesses accounts for almost one quarter of the United States’ emissions from all sources, or about 1.5 billion metric tons of carbon dioxide equivalent greenhouse gases in 2014 alone. Obviously transportation is another big source of emissions, but it would take 10 million cars traveling across the Unites States over 140 times each to generate as much greenhouse gas emissions as is created by electricity generation each year (which, by the way, would take just over 200 days assuming none of the drivers slept and they maintained a constant speed of 75 mph). Then of course, if we all drive electric vehicles, that will only further increase our electricity needs. All that electric power needs to come from somewhere! It is becoming increasingly clear that in order to combat the climate change that we are witnessing, and that we are causing, we must turn to renewable energy sources for our electricity needs. For many homeowners, especially in Florida, a PV solar installation can generate as much electricity as they will use over the year, saving about 7.7 metric tons of CO2 emissions each year! Let’s do our part, together. Uptown Energy Solutions is Florida’s premier Full-Service Solar Consultant. Our service areas include Orlando, Windermere, Lake Nona, Lake Mary, Doctor Phillips, Tampa Bay, and Melbourne, FL. Call: (407) 801-4242 or E-mail: style@uptownenergysolutions.com for solar panel installation cost and consultation.